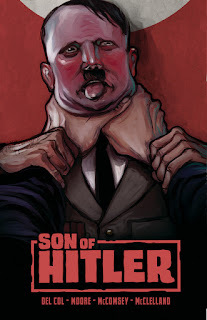 PORTLAND, OR — Image Comics is pleased to reveal preview pages from the “controversial” graphic novel SON OF HITLER, which will hit shelves this June. The alternative history story, written by acclaimed creators Anthony Del Col and Geoff Moore with art by New York Times bestselling cartoonist Jeff McComsey, explores a longstanding legend from the war with a twist that chillingly echoes today’s hostile American politics. In the darkest days of World War II, SON OF HITLER follows a rogue female spy handler who discovers a shocking secret—that when stationed in France during the first world war Adolf Hitler fathered an illegitimate child. She finds this young man in Occupied France and recruits him to get close to—and kill—his biological father and end the war. In the vein of The Man in the High Castle, Inglourious Basterds, and Zero Dark Thirty, the story’s creators were inspired by recent worldwide political events to craft a completely new ending. Perhaps as a reflex of the recent rise of white supremacist groups in the news, stories of World War II and Nazism are growing in every medium, from film (Dunkirk, Darkest Hour) to video games (Call of Duty: WWII, the revived Wolfenstein franchise) and even television (The Man in the High Castle, the just-announced Jordan Peele project The Hunt). Canadians Del Col and Moore turned to indie stalwart McComsey (FUBAR, Flutter), who has done many stories and anthologies set during World War II and has created a book that feels like it’s from the era. 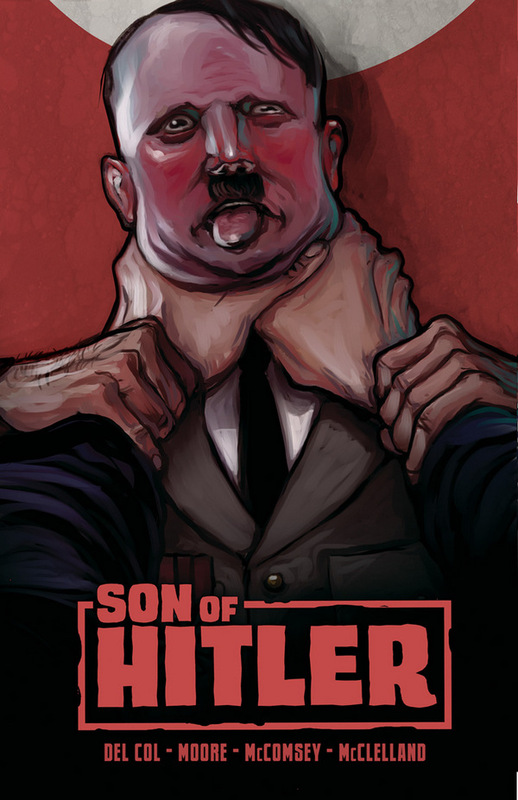 First announced at the prestigious ImageExpo in February, SON OF HITLER (ISBN: 978-1-5343-0224-2, Diamond Code: MAR180612) is an original graphic novel that will hit comic shops on Wednesday, June 20th, 2018 and bookstores on Tuesday, June 26th, 2018. It can be pre-ordered on Amazon, Barnes & Noble, Books-a-Million, IndieBound, and Indigo.